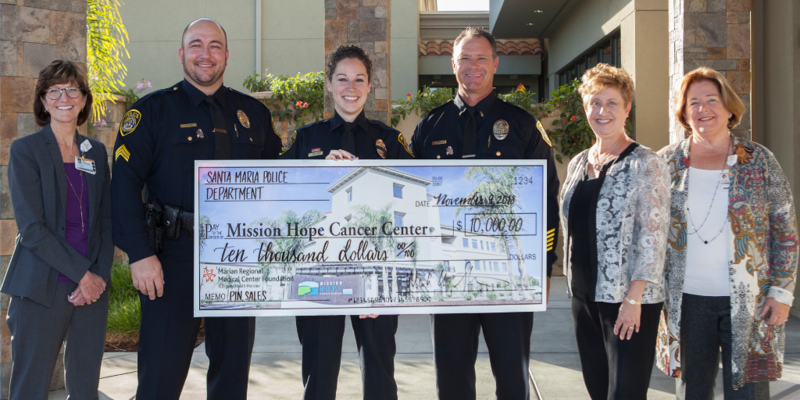 Leaders of the Santa Maria Police Department Breast Cancer Awareness Pink Pin Fundraiser present $10,000 to benefit patients at Mission Hope Cancer Center. Pictured from left to right: Sue Andersen, Marian Regional Medical Center President & CEO, Sergeant Matthew Line, Officer Tiffanie Delaney, Lieutenant Mark Streker, Katherine Guthrie, Cancer Services Regional Director, and Kathy Sullivan , Vice President, Post-Acute Care Services. Breast cancer doesn’t affect just women; it affects everybody. That is why members of the Santa Maria Police Department chose to stand up against this disease in the month of October. In recognition of October as Breast Cancer Awareness Month, the Santa Maria Police Department sold special breast cancer awareness pins to raise funds for local cancer patients in need. These pins were worn by the supporting team in the police department, uniformed officers, and members of the community throughout the month of October with proceeds benefiting Marian Cancer Care at Mission Hope Cancer Center. Led through the efforts of Lieutenant Mark Streker, Sergeant Matthew and Saundra Kline, and police officer Tiffanie Delaney, this inaugural effort flourished in Santa Maria raising $10,000. All four leaders of this effort have been personally impacted by breast cancer by either having the disease itself or have supported their spouse or mother in their fight against cancer. Initially, the group ordered 1,000 pins that would be sold throughout October for $10 apiece. They simply were not expecting over 900 pins to be purchased within the first two weeks! Catching the fundraising spirit, the Santa Maria Police Department also chose to participate in “No-Shave November” to raise funds for local cancer patients again, proving that generosity is something that can grow easily.